1. Used for thermal insulation of various heat sources (coal, electricity, oil and gas) high temperature equipment and central air conditioning pipelines. 2. 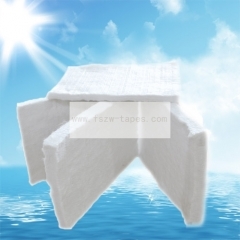 Used for various heat insulation and fire protection materials. Sealing, sound-absorbing, filtering and insulating materials for special places. 4. Used for thermal insulation of various heat transfer and heat storage devices. 5. Used for sound insulation, thermal insulation and heat resistance of vehicles, boats, airplanes, etc. 6. Sound insulation to the inner core of automobile and motorcycle muffler and engine. 7. Thermal insulation between colored steel plate and wooden structure house. 8. Thermal and chemical pipeline insulation effect is better than general insulation materials. 9. Insulation and heat preservation of the wall panels of household appliances, such as air conditioning, refrigerator, microwave oven and dishwasher. 10. Other occasions requiring heat preservation, heat insulation, fire prevention, sound absorption and insulation.